There are nearly three million adults in the U.S. alone that are in prison or jail. Many of these being parents that leave behind unanswered questions with their children: What is jail? Why did this happen? Is it my fault? Is my daddy (or mommy) bad? Do they love me? 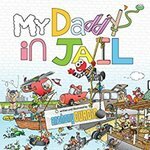 My Daddy's in Jail is a story of two bears who have a father in prison. The book is narrated by a very odd cockroach. Curcio, Anthony, "My Daddy's in Jail" (2015). DIVerse Families. 896.